This bread is a tasty loaf great for sandwiches, spreads or eating with a meal. It is hearty and the Odyssey® Greek Yogurt gives it a soft, smooth texture. This bread is a tasty loaf great for sandwiches, spreads or eating with a meal. Place oven rack in center of oven and preheat to 375⁰F. Line a large rimmed light-colored baking sheet with parchment paper; set aside. To prevent bread bottom from over browning, set the parchment lined sheet pan inside another unlined sheet pan. Baking with stacked pans gives needed insulation. In a large bowl, add flour, wheat bran, sugar, baking soda and salt; whisk to combine. Cut butter into small pieces and add to dry ingredients. Combine with fingertips until dry mixture resembles a fine crumb. Warm Greek Plain Yogurt in a microwave-safe dish for about 30 seconds on high and stir. Pour warmed yogurt into center of the flour well and stir to combine. Do not over stir. Dough will be coarse with very large crumbles. Transfer dough onto a lightly floured work surface, gather and knead for about 2-3 minute, until dough comes together. Form into a 6-inch round loaf. Dust top of loaf with ½ teaspoon of flour. Place loaf on the prepared baking sheet. Use a serrated knife and cut a cross in the top of the loaf, about ½-inch deep. Bake until done, about 35-40 minutes. If the top of the bread begins to over brown and the baking time has not been completed, lightly tent with foil. Bread should sound hollow when tapped on the bottom. Place loaf on a wire rack to cool. Slice and serve. 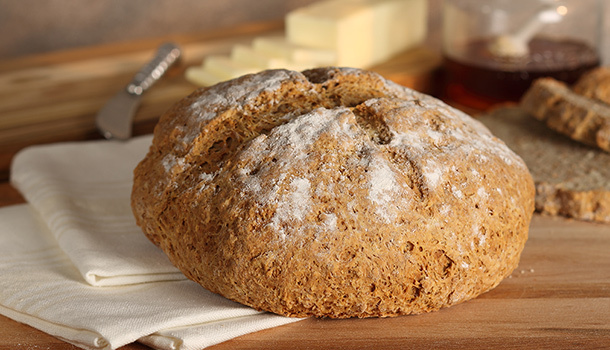 This easy-to-make brown bread is great for toasting.